In March 1996, when the traveller and his companion finally reached Cape Town, it was time to start making sauce: Ukuva iAfrica was born. The recipes of the first four sauces were selected from the draft of "Recipes from a Rucksack", a journal he had started at the beginning of his travels. Of the original 'Big Four' : Swazi Mama Mamba, Malawi Gold, Zulu Fire Sauce, only Umsobu Iyababa was discontinued. (Umsobu Iyababa was a violently purple/pink beetroot based sauce that was way too hot for most mere mortals!). Over the years, more flavours joined the family. Some sauces are quite hot - like Swazi (it looks innocent but packs a serious chilli punch) and Malawi - some that are hot/mild like Zulu Fire Sauce and Harissa - others are warmly fragrant like Chermoula, Peri Peri, Cha-ka-la-ka, Cape Malay and Safari BBQ. So much of the (often untold) Ukuva 'back story' is fair trade. There is a fitting synergy - The spice tradition of Africa is intricately woven into the story of spices from the India - so much iniquitous trade exploitation still happens in India (and Africa!)... It seemed like a good idea to have some of the pepper-base grinders FLO certified (since we've been packing them with Fairtrade pepper anyway!). 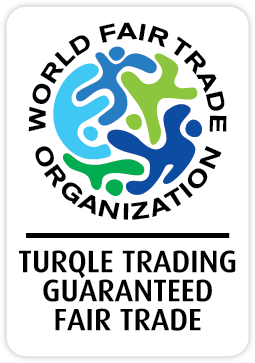 In 2015, Turqle Trading also earned the WFTO Guarantee System logo. This logo which will be on the back of every product, means that Turqle Trading (the brand holders of Ukuva iAfrica) are a GUARANTEED FAIR TRADE ORGANISATION by the World Fair Trade Organisation. One day the traveller came across a note in one of his journals about the conversation he had had with a modern-day camel driver. One of the essentials in the 'kitchen' of the camel train is a mash of salt and chilli - sometimes with other spices - the universal condiment. Meet HOT ROCKS. HOT DROPS are the HOTTEST news: Table sauces made to add instant chilli 'zing' to prepared foods... be sure to try them all! There are a few uniquely South Africans blends of flavoured salts that are worth exploring.